Once I am overseas, I travel blindly when it comes to finances. I just don’t want to know how much the Euro is really costing me. But this trip took us to Central Europe, and I was always curious about how cheap dinner – or how expensive a hotel really was. As we romped around, my trusty financial wizard was GlobeConvert, a handy free iPhone app that I found myself using repeatedly. 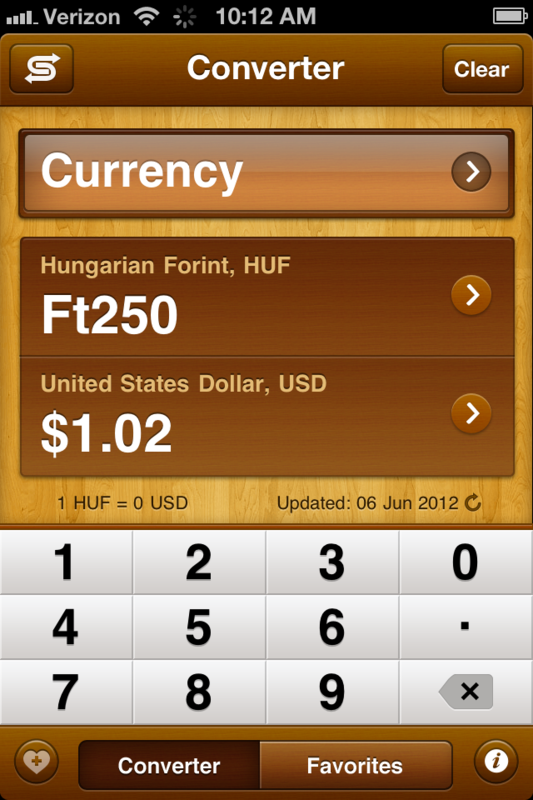 Known as Convert once downloaded from the Apple App Store, the app converts over 190 different currencies, temperature, weight, distance and speed, just to name a few. I also liked the fact that I could preset favorites in advance and easily flip to new currencies whenever we crossed the border. The only catch is that you need to be connected to Wifi or 3G to use the app, but found most cafes will give passwords to customers. You can find more about more Globe products on its website. This entry was posted in Travel and tagged app, iPhone. Bookmark the permalink.